The United States is blessed with a huge coastline. With the Atlantic Ocean to the east, the Pacific Ocean over on the west, and the Gulf of Mexico to the south, there’s an almost endless stretch of shore to explore, with hundreds of magical beaches just waiting to be enjoyed. With so many exciting coastal locations, it’s no surprise that heading down to the beach is one of America’s favorite activities, and it can be enjoyed all around the nation. There’s nothing quite like breathing in the fresh sea air, feeling the soft sand beneath your feet, and even wading out into the water. Locations like Miami and Los Angeles boast some of the most famous sunny beaches in all of North America, but there are plenty of wonderful coastal spots to be found further north. New England, for example, is home to some of the oldest beach towns and cities in all of America, and there are some gorgeous shoreline landscapes to be found in states like Massachusetts. Gloucester is a particularly famous spot for beach-goers in New England, with the city and surrounding Cape Ann area offering a lot of lovely beaches for locals and tourists to explore and enjoy. Gloucester and the surrounding area have a lot of picturesque beaches to choose from. These locations aren't exactly suitable for the more extreme water activities associated with Californian or Floridian beaches like surfing and snorkeling, but they're super spots for people to relax, swim, sunbathe, and simply admire the scenery, with lots of unique rock formations and interesting wildlife to look out for. 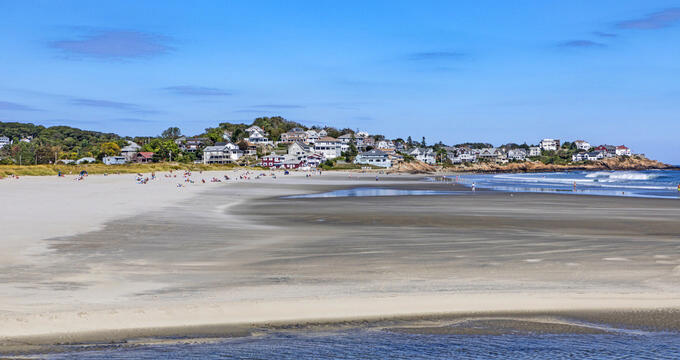 If you’re planning a trip to Massachusetts and hoping to spend some time on the coast, read on for some information on the very best beaches around Gloucester and Cape Ann. One of the most popular beaches in Gloucester, Good Harbor Beach faces out onto the Atlantic Ocean. It features lovely white sands that wouldn't look out of place on a Caribbean Island and there are lots of amenities here too like concessions, showers, and restrooms. Parking fees can get quite pricey here, however, and the parking lots can feel up quite quickly at the weekends or on special occasions, so it can pay off to arrive early. This beach is kept especially clean and offers some stunning views of the surrounding area and the ocean itself, making it a lovely place to spend the day. Easily accessed from Stacy Boulevard, which is where many Gloucester tourists go to see the city's famous Fisherman Statue, Pavillion Beach is another super shoreline spot in the Cape Ann area. It's only a little beach, but many people don't even know it exists so it never gets overly crowded or noisy. There aren't any facilities or amenities here either, but the local area has some good eateries, stores, and snack bars, and it's easy enough to find a parking spot on Stacy Boulevard or another nearby street. One of the two Gloucester beaches in Stage Fort Park, Half Moon Beach earned its name due to the crescent-shape of its formation, resulting in calm waves and ideal paddling or swimming conditions on warm days. The surrounding park offers a lot of shade and nice grassy areas to have picnics or simple strolls, and the beach itself offers some unbeatable views of the nearby harbor. Kayaking is very popular around Half Moon Bay, and the beach is a super spot to spend a sunny day lazing around with a good book or good company. Fishing and sailing are highly enjoyable off this beach as well. Located in the nearby Cape Ann town of Rockport, Front Beach is another option for people looking for some sandy fun near Gloucester, MA. This beach is lined with pretty houses and hotels and dotted with boulders that give it a really unique charm and personality. It's easy to access and has several amenities and useful features including restrooms, local restaurants, and on-duty lifeguards to keep everyone safe. Swimming and sunbathing are the best activities at this beach. The other beach in Stage Fort Park is Cressy's Beach. Unlike Half Moon Beach, which offers quite large stretches of sand, Cressy's Beach has quite large rocky areas and only small sections of sand. This makes it less busy overall, so it's a nice spot for anyone looking for a quiet, intimate beach environment to spend some time. If you're looking to do some swimming at a Gloucester beach, you're better off visiting Half Moon Beach or Good Harbor Beach, but if you want to just sit back and relax in a peaceful area, Cressy's Beach is a nice place to go. Located just off Atlantic Street in the western side of the city, this Gloucester Beach offers breathtaking views of Ipswich Bay and the mouth of the Annisquam River. Restrooms, showers, and concessions can be found here to help all visitors make the most of their stay, and there's a parking lot too but it doesn't have too many spaces, so it's a good idea to get there earlier if you plan on visiting on a holiday or sunny weekend. Along with Good Harbor Beach, Wingaersheek Beach is one of Gloucester's most popular places, so you can definitely expect to see some crowds here when the sun comes out. It's a nice spot for families, with shallow waters that are just right for wading and swimming with little ones.